Affectionately dubbed the “Great ’58,” this collection of 1958 inspired hollow and solid body Custom Shop models created by Master Builder Stephen Stern debuted at the 2017 NAMM show. 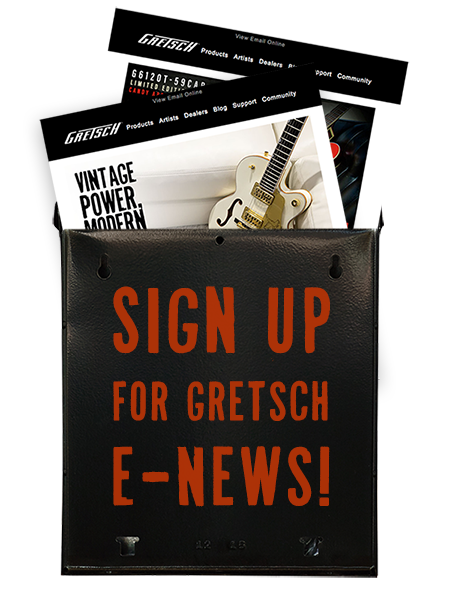 1958 was a transitional year for Gretsch, which included the beginning of Filter’Tron™ pickups featuring plain covers and flat-top bezels. These timeless beauties capture those key specs, along with the essence of the era with relic’d finishes and custom Cadillac colors from 1958. 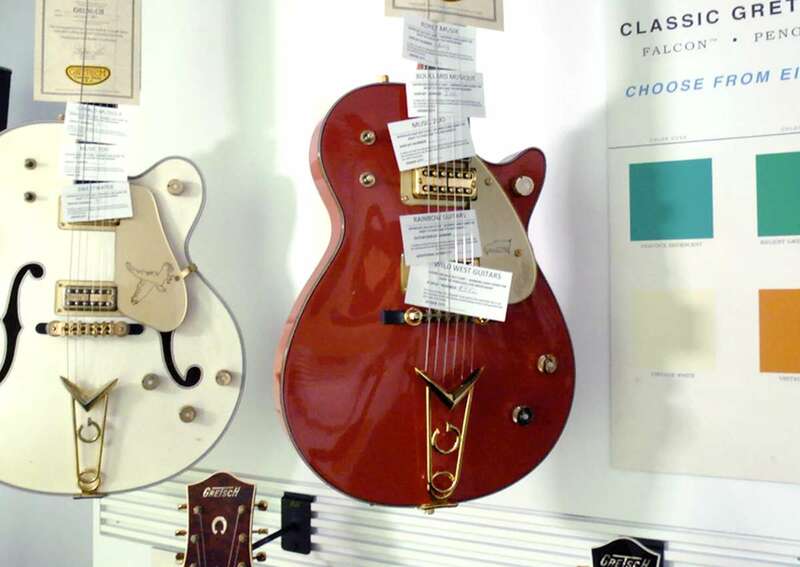 The pinnacle of the Gretsch collection, this prized Falcon™ is constructed of laminated maple with an arched top. It also features a ’55 style maple neck, ebony fingerboard with engraved bird-themed humpblock inlays, TV Jones Filter’Tron™ pickups, a Space Control™ bridge, “G” Cadillac tailpiece and jewel arrow knobs. Unique to 1958, this Falcon has both a tone switch and a tone knob, which changed to simply a tone switch one year later. A relic’d Vintage White finish and aged gold hardware complete this beautiful instrument. This dreamy Falcon features a wide hollow body with an arched laminated maple top and maple neck, and the ebony fingerboard offers humpblock inlays that are engraved with bird-themed icons. It’s also equipped with TV Jones Filter’Tron™ pickups, a Space Control™ bridge, “G” Cadillac tailpiece, jewel arrow knobs and Grover® Imperial tuning machines. The gold hardware and gold sparkle body and f-hole binding make this bird soar with style in a bright and beautiful Peacock Iridescent finish. Outfitted in traditional Gretsch orange, a color that was very standard for this time period, this 6120 hollow body is constructed with a laminated maple arched top, and features a maple neck with an ebony fingerboard and thumbnail inlays. This custom guitar also features TV Jones Filter’Tron™ pickups, a rocking bar pinned bridge, Bigsby® B6 tailpiece and “G” arrow control knobs. Regal and sophisticated, the G6128 CS 1958 Duo Jet™ in Regent Green Iridescent features a chambered mahogany body with a laminated maple top, a mahogany neck and rosewood fingerboard with thumbnail inlays. This luxury Jet also offers TV Jones Filter’Tron™ pickups, a rocking bar pinned bridge, a “G” cutout tailpiece and “G” arrow control knobs. The G6128 CS 1958 Duo Jet™ is the ultimate classic in Relic Black. The chambered mahogany body is constructed with a laminated maple top and features a mahogany neck with a rosewood fingerboard and thumbnail inlays. The model is also outfitted with TV Jones Filter’Tron™ pickups, a rocking bar pinned bridge, “G” cutout tailpiece and “G” arrow control knobs. This cool Penguin is on fire in a Relic Dakota Red finish. The guitar features a chambered mahogany body, laminated maple top, mahogany neck and ebony fingerboard with thumbnail inlays. TV Jones Filter’Tron™ pickups, a Space Control™ bridge, a “G” Cadillac tailpiece, jewel arrow control knobs and Grover Imperial tuning machines finish off this exquisite vintage work of art. This flashy Silver Jet™ is a showstopper! The chambered mahogany body is a striking complement to the silver sparkle top with off-white binding. This model also features a mahogany neck, rosewood fingerboard with thumbnail inlays, TV Jones Filter’Tron™ pickups, a rocking bar pinned bridge and “G” arrow control knobs. Like a tropical sunrise, this beautiful bird features a chambered mahogany body with laminated maple top, mahogany neck and ebony fingerboard. It’s also equipped with TV Jones Filter’Tron™ pickups, a Space Control™ bridge, “G” Cadillac tailpiece and jewel arrow control knobs. Its unique Tahitian Coral Iridescent color is enhanced by gold sparkle binding and black purfling.